Throughout the Yemen conflict, tribal organizations have played a major role in both supporting and resisting Houthi rule. Although not a tribal organization themselves, Houthi leaders are intimately familiar with Yemen’s tribal systems and have managed to win over many tribal allies, mostly utilizing the networks of former president Ali Abdullah Saleh. Other tribal organizations have stood staunchly against the Houthis, notably those in the south and central areas of the country. However, over the past six months, Houthi forces deployed across the country have engaged in an increasing number of conflicts with local tribal forces in territory under their control. While high intensity clashes have continued to escalate within Hajjah and Ad Dali governorates, smaller scale clashes within Houthi territory have also been reported at an increasing rate. 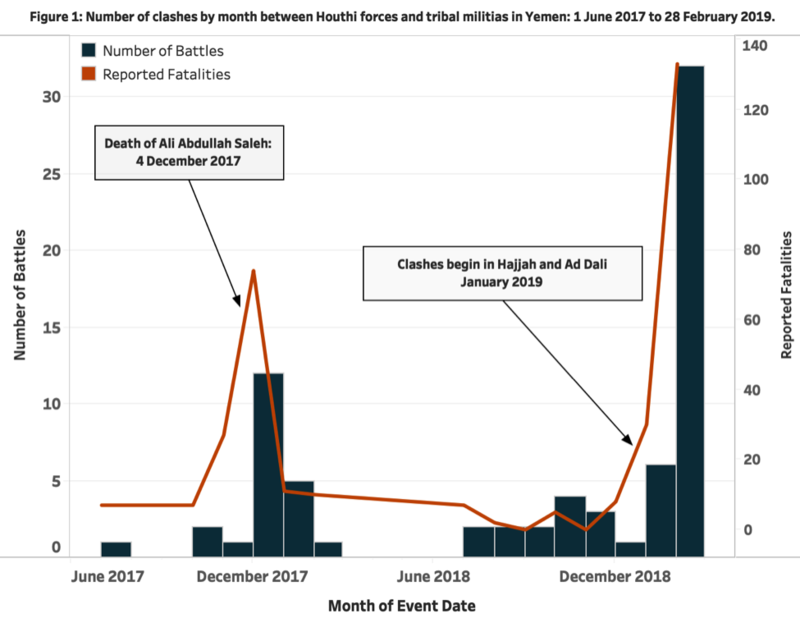 This increase in clashes, along with reports of heavy handed repression within Houthi territory, could indicate that Houthi figures have failed to maintain tribal relationships as they were prior to the death of Saleh (see Figure 1). The Saudi-led coalition and internationally-recognized government under Abdrabbuh Mansur Hadi have reacted quickly to support rebelling tribal forces in this regard by providing air support, supplies, and troops. Former president of Yemen Ali Abdullah Saleh spent his time as president carefully building and maintaining relationships with Yemen’s powerful tribes. These relationships continued even after his presidency, playing a vital role in enabling the Houthis (then his allies) to quickly take control of large swaths of the country. After the end of the Houthi-Saleh alliance in December of 2017, the Houthis were without the tribal relationships they once enjoyed (ACLED, 16 February 2017). “Stripped of any [political] cover, [the Houthis] are shown purely as a religious sectarian movement, ruling with force and repression” (Washington Post, 6 December 2018). Increasing Houthi repression within territory under their control is evidenced by an increasing number of reports detailing arrests and housing demolitions, often sparking clashes. This is particularly true in Al Husha district of Ad Dali governorate where Houthi forces sparked clashes with local tribesmen after blowing up the house of tribal leader Abdul-Jaleel Al Hothaiyfi for allegedly collaborating with the Saudi-led coalition (The National, 13 February 2019). Intense clashes are likewise taking place in Kushar district of Hajjah governorate, sparked by Houthi recruitment campaigns and attempts by Houthi forces to use tribal lands as access to battlefronts further southwest. The Saudi-led coalition has in turn been quick to support the tribesmen, providing at least 5 airdrops of weapons and supplies over the past two weeks (Aden Al-Ghad, 2 March 2019). Smaller clashes have likewise sporadically occurred in Ibb, Dhamar, and Sana’a governorates over the past 6 months (see Figure 2). The extent to which the current uptick in clashes between Houthi militias and tribal forces will influence the overall conflict in Yemen is yet unclear. Despite heavy fighting and a high number of fatalities reported on both sides, territorial gains have been relatively small. If clashes continue to occur in new areas, it is unlikely that the Houthis will be able to sustain current levels of conflict, which may affect their ability to control certain parts of the country.